Today, digital marketing campaign reporting is a passive documentation of outcomes, a static report of disparate metrics at the conclusion of a campaign which is not actionable or particularly insightful. In a world where marketing metrics are in the hot seat, Wyng has created a tool that eliminates the ‘grey area’ of campaign measurement, and gives marketers a real measurement tool that helps them better understand the value and performance of each campaign. 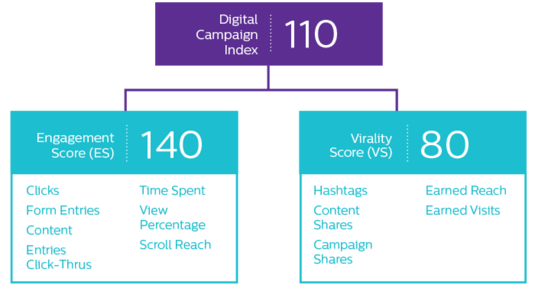 The Digital Campaign Index (DCI) uses the two biggest factors that contribute to campaign value and performance -- Engagement and Virality -- to distill metrics into a single, executive-level performance indicator. With hundreds of marketing metrics to choose from, and most measuring something of value, it can leave marketers lost trying to pull insights out of the chaos of data available to them. 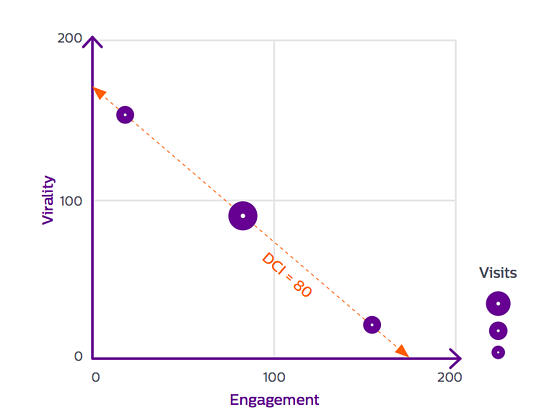 The DCI aggregates campaign performance metrics, turning them into actionable insights in the form of a score between 0-200. This gives marketers the ability to not only understand the outcome of a particular campaign, but assess its overall impact related to other campaigns they’ve run in the past. This ability to compare apples to apples and apples to oranges enables a marketing team to improve their digital strategy over time. For example, in the chart below, one campaign skews toward engagement, another skews viral, while a third is evenly balanced -- and all three have a DCI of 80. 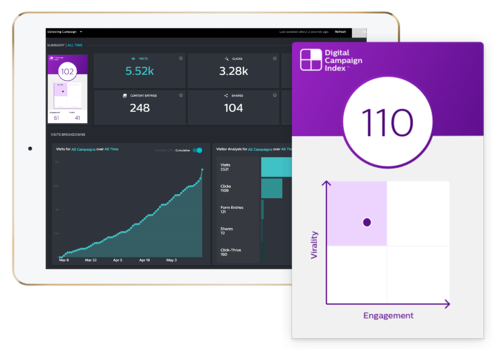 By standardizing underlying metrics that impact campaign performance, the DCI makes it easy for marketers to visually understand how their campaigns are performing individually, and on a broader, more strategic scale. When marketers know their campaign scores, standardized across every digital campaign, they can optimize their campaigns - no matter what level of available resources. To discover how to activate your own DCI, download the next installment of our Digital Campaign Index Whitepaper. Missed the first installment of our Digital Campaign Index blog series? To read our blog, "The Evolution of Brand Marketing" and download the first installment of our Digital Campaign Index Whitepaper on the most significant problem facing today’s brand marketing, click here.